Economic sustainability is discussed in the light of resource dependency, exemplified by a case study of Paragominas, a municipality in eastern Amazonia, Brazil, where the economy is highly dependent on logging and wood-processing. Timber resources in Paragominas are currently being rapidly exploited and high deforestation rates threaten the very basis of the local economy. First, Paragominas’ GDP is produced in a 26-year time series (1970-1996), as well as the timber related user costs, applying El Serafy’s calculation method. Secondly, a brief review of existing cost-benefit studies with data from Paragominas is presented. The article demonstrates the risks involved when the basic conditions of the cost-benefit analyses are not fulfilled. Estimation of shadow prices and forecasting of changes in relative prices leaves many questions unanswered, and the concept of economic sustainability easily reduces itself to one of economic efficiency. As an early warning system of unsustainability, the user-cost method is a more suitable methodological tool. All economies depend ultimately upon the availability of resources in their productive system. But ‘resource dependent economies’ are those where the major income-generating activity consists of primary natural resource extraction and its transformation. In such economies, the resource-dependency relationship is more apparent. Sudden changes in resource demand may compromise their ability to generate and/or sustain welfare. Not surprisingly, resource dependent economies are more fragile and exposed to crisis than less resource-dependent ones, especially, when only a few products are extracted and transformed. Resource dependent economies may experience periods of rapid growth and prosperity, but scarcity of a key resource leads almost inevitably to the decline of the resource-dependency model, leading to decline with all its implications, namely recession, unemployment and decapitalisation. Depending on the ability of these economies to rapidly diversify their economic activities and sustain welfare levels, they may or may not pursue a successful transition to a less resource-dependent model. The theme of sustained welfare (or sustained utility) in resource dependent economies is not new in the literature (see Hartwick 1977, cited in Pearce and Atkinson 1992). However, it is only recently that the link between economic sustainability and sustained welfare has been established and discussed in terms of its dependence on the availability of natural capital (Pearce 1988). Understanding how resource dependent economies respond to different and changing conditions (resource abundance, scarcity, fluctuations in external demand, low value of resource rents, technological change etc.) is relevant in comprehending economic sustainability, not only for the sake of these economies, but also as a means of understanding global resource dependency. This article, based upon the economic history of Paragominas, is intended as a contribution towards this understanding. Paragominas is a municipality in eastern Amazonia, Brazil, where the economy is almost entirely based on the extraction and primary processing of timber resources. A large number of timber processing facilities are currently exploring what is left of a rain forest territory almost the size of Belgium. After 25 years of intense exploration, more than half of it is already deforested. Although the dependency on forest resources is obvious in the economic history of Paragominas, loggers have systematically overlooked the regenerative capacity of the same forests, due to their relative abundance, and have therefore missed the chance to promote sustainable forest management. The data points out that future generations in Paragominas will not benefit from the same access as current ones, losing therefore this possible source of welfare. It is however worth considering that the hectic extraction and transformation of forest resources in Paragominas, which expanded considerably throughout the 1970s and 1980s, also contributed to generating outstanding income figures. The average per capita GDP went from $470 in the 1970s to $5,700 in the 1990s. The latest trends in the 1990s indicate, though, that this growth will not be sustained. As timber resources become scarcer in this ageing Amazonian frontier, local entrepreneurs are looking for ways of maintaining the profitability of their businesses. Owners of logging companies are either trying to increase the value added per unit of processed timber or they are looking for alternative investments. In all cases, the data on Paragominas presented here indicates that the sustainability of the local economy will depend on its ability to pursue a timely transition, where it diversifies to less resource-intensive activities while maintaining levels of welfare. The two main objectives of this paper are: i) to analyse the macro-economic significance of resource dependency in Paragominas; and ii) to discuss the adequacy of El Serafy’s user cost as a method of assessing economic sustainability. The core idea of sustainable development is that ‘the well-being of current generations should not be advanced at the expense of future generations’ (Barbier et al. 1990, p. 1260). Within this framework, it is the long-term processes that are at stake. Intertemporality thus becomes a basic concept in capturing economic sustainability, and issues of ecological sustainability regarding resource use and environmental quality are also relevant in assessing the level of well being. In this sense, ecological sustainability is either mainstreamed or incorporated into the concept of economic sustainability. However, operationalisations of economic sustainability have tended to focus more on non-declining measures of welfare (El Serafy 1997, p. 217), and less on the continuity of resource flows and/or essential environmental services. Two intertemporal principles have been pointed out in the literature as being especially relevant for defining criteria of economic sustainability: equity and efficiency (Pearce and Atkinson 1992; Common and Perrings 1992; Munda 1996). Intertemporal equity can be said to relate directly to how natural assets, real income, and consumption allowances are divided between present and future generations. Ensuring the availability for natural resources to future generations is therefore a key issue. Efficiency as such is about optimal resource allocation, based on the best knowledge of the current relative prices, while intertemporal efficiency focuses on the maximisation of the Net Present Value (NPV) function over time. Possible fluctuations in relative prices are taken into account in intertemporal efficiency. And, if the sustainability approach admits substitution between capital types, changes in the mix between natural and man-made capital in the productive system are also considered. Intertemporal efficiency has been discussed by other authors. Hotelling (cited in Common and Perrings 1992) showed that efficient intertemporal allocation of non-renewable resources would require that their price net of extraction costs (or the resource rent) should increase at the rate of interest. Hartwick stated that real consumption based on the exploitation of such resources can only be kept constant if the rents derived from it are reinvested in reproducible capital (Hartwick cited in ibid.). And Solow indicated that this investment should be equal to the depreciation of the natural resources in question (Solow cited in ibid.). The Hotelling-Hartwick-Solow rule combines these three conditions. It is worth noting that the Hotelling-Hartwick-Solow rule assumes perfect substitution between natural and man-made capital, thus falling into the framework of weak sustainability. Hence, the fact that some natural capital may be essential to production and that some types of environmental degradation are irreversible has no significance for the rule (Common and Perrings 1992; El Serafy 1997; Jamieson 1998). According to this interpretation, intertemporal efficiency would be guaranteed even in situations of resource exhaustion, disruption of ecosystems or total saturation of their assimilative capacity, simply by reinvesting in reproducible capital (Common and Perrings 1992). Therefore, some degree of arbitrage can be attributed to the rule. Although the approach is operational, it is too narrow. Common and Perrings (1992) showed that if the Hotelling-Hartwick-Solow rule were to be realised, it would have to rely on the existence of contingent markets where agents contracted with full knowledge of current and future prices and where the full social costs of resource use were realised through optimum prices. Such conditions, although sufficient for intertemporal efficiency, are said to only exist in theory (ibid.). Moreover, price efficiency is given by a series of equilibria. Thus, intertemporal efficiency hinges ultimately upon the will of present consumers, who influence price changes through a set of current preferences and expectations regarding future prices. However, this is no guarantee that the (theoretical) conditions for intertemporal efficiency will be fulfilled. In fact, the sovereignty or prevalence of current consumers may even jeopardise the possibility of complying with these conditions. The authors reject sustainability based upon consumer sovereignty as long as it threatens the general system (including ecological systems) and the welfare of future generations. They indicate instead that it is not prices but the optimal value of the stock of capital — including natural and man-made capital — that should be a sustainability issue (ibid.). The idea of focusing on the capital stock is also explored in Pearce, Barbier and Markandya (1990; see also Pearce 1988). A different approach is pursued by Dasgupta and Mäler (1994), in which, instead of stock, the focus is on flow. The authors suggest that a set of socially (and implicitly environmentally) optimum prices, or shadow prices, should be used to estimate the return on wealth of an economy measured in terms of well-being. This measure of wealth is expressed by a ‘real net national product’, or a linearised version of the current-value Hamiltonian (the sum of the flow of current well-being and the shadow value of all the net investments currently being undertaken) (ibid. pp. 324-25). Dasgupta and Mäler claim that agent-relative shadow prices can be estimated in practice. This is doubtless a very complex task, as is the estimation of the total economic value of an environmental asset (Munashinghe and Lutz 1993). El Serafy’s user-cost method can be understood as a combination of the idea of focusing sustainability assessments on flow (through capitalised income estimates), stock (through the periodical estimation of the life expectancy of a natural resource), social time preference (through the choice of discount rate) and value (through the use of resource rents in the calculation). We shall examine this method at length and complete an empirical study by calculating timber-related user costs in Paragominas within a 26-year time period. We shall seek to determine how and to what extent the user-cost method and cost-benefit analyses relate to sustainability, through the principles of intertemporal equity and efficiency. "...to estimate the value of ecosystem resilience foregone by biodiversity depletion. That is, the challenge is to estimate the stream of benefits foregone as a result of the contraction of the range of environmental conditions in which ecosystems can continue to provide positively valued ecological services." We find that there is a lack of a broader comprehension of the concept of ‘economic sustainability’. In most of the literature today, ecological sustainability is either assumed to be totally incorporated into economic sustainability (whether implied or not in the concept of well-being), therefore becoming redundant, or economic sustainability is equal to profit maximisation derived from environmentally disruptive activities or duly compensated resource-depleting revenues. Economic sustainability becomes an issue of pure economic viability, thus losing the analytical power that the concept should have. However, unsustainability is easier to characterise, especially in a situation of resource dependency. Decline in economic activity due to depleting natural capital is a clear sign of an unsustainable path. But by then, it may already be too late to change the path. In this article, the economic history of Paragominas, with its patterns of capital substitution and complementarity, will serve as an example of how unsustainability can be characterised and measured, and whether the user-cost method can show its usefulness in sounding the alarm earlier. Figure 1 The economic territory of Paragominas. The municipality of Paragominas is located in the northeastern part of the state of Pará, comprising a territory of 24,500 square kilometres. It was founded in the mid-1960s with the opening of the Belém-Brasília highway, and its current population is almost 80,000 inhabitants. Since the early 1970s, the pace of economic growth has increased rapidly, and the original landscape of mature rainforest has undergone significant changes. Paragominas is an old frontier in the recent process of occupation of the Amazonian space. What happened there ten or fifteen years ago might be happening now in new frontier areas. The economic history of Paragominas is impressive. In the 1970s and 1980s, Paragominas was the laboratory for the Brazilian government’s subsidised cattle ranching projects. In those early days, timber had little or no value in a predominantly agrarian economy. Although the cattle sector was never able to generate as much revenue as the timber sector, it nevertheless played an important role in the development of Paragominas by attracting investment and opening up a road network that would later permit the intense exploitation of Paragominas' timber resources. Immense areas were cleared by burning to make room for pasture. Cattle ranching in Amazonia — Paragominas being a good example — has been extensively criticised, not only for being economically unsustainable and generating a negative NPV under certain circumstances, but also for promoting massive deforestation (Browder 1988; Hecht et al. 1988; Binswanger 1989; Mattos and Uhl 1994). On the other hand, the first attempts to increase the useful life of pasture in the Amazon and introduce more adapted cattle breeds have also taken place in Paragominas, confirming the impression that this unique municipality is, in many senses, in the forefront of Amazonian frontier development. The first sawmill in Paragominas started operating in the early 1970s. Since then, the number of wood-processing facilities has increased at a very rapid pace, reaching more than 140 by the 1990s. Contrary to the previous period, when forests were seen as an impediment to development, the existence of wood-processing facilities and therefore of increased local competition for easy access to timber, turned the forest into a valuable asset. Forests are not managed with the aim of securing future production of timber, although a few isolated pilot initiatives have taken place in Paragominas. A typical sawmill in Paragominas with one production line processes 9,200 cubic meters of roundwood, and consumes on average 240 hectares of mature forest a year (Veríssimo et al. 1992). Although logging operations in Paragominas are selective, they are generally unplanned and excessively wasteful, causing significant damage to canopy cover and remaining trees (ibid.). This compromises forest regeneration and leaves the area impoverished and prone to fires (Uhl and Buschbacher 1985; Veríssimo et al. 1992; Barreto et al. 1998), which is characteristic of the predatory use of forest resources. We estimate that between 53 percent and 63 percent of Paragominas' original mature forest has already been deforested (see footnotes (a) and (b) of Table A-2 in the Appendix). Field interviews with local entrepreneurs indicate that much of the revenue generated by the wood sector is generally not expatriated, but reinvested in productive activities in Paragominas, either in the industry itself or in ranching. Ranchers who are not directly linked to the industry may also make a profit by selling logging rights as a way of capitalisation. The revenues derived from such deals are generally used for rejuvenating pasture, as weed invasion and subsequent degradation represent a serious constraint in ranching in Amazonia. Hence, the bulk of resource rents generated by the wood industry in Paragominas, probably 60-70 percent, can be said to be invested in pasture and cattle improvement. Calculating Paragominas’ Gross Domestic Product (GDP) was the first step towards an assessment of economic sustainability. As Paragominas’ economy is highly dependent on timber resources, we estimated timber related user costs and compared them with the traditional GDP measure. GDP was calculated from the supply side by estimating the yearly contribution of each economic sector in Paragominas. The VA of each sector was calculated in basic prices covering all years from 1970 to 1996. As the cost structure of enterprises was known in different baseline years, it was possible to assess the VA for that year and extrapolate it for the whole time series (see footnotes in Table A-1 for details) . As mentioned before, certain sectoral subsidies have been substantial in the past, and a calculation of factor costs would therefore have been preferable. However, it was not possible to collect relevant data on sector specific taxes and subsidies at municipal level. Figure 2. Annual average growth of Paragominas’ per capita GDP and average annual increase in number of wood-processing facilities, 1970-1995. It could be questioned whether the negative growth figures observed in the 1990s in Paragominas were not a reflection of the general economic contingencies suffered by Brazil, such as recession, hyperinflation and negative economic growth . However, our data showed that, with the exception of the wood sector, all other sectors continued to grow modestly after 1990. (Table A-1 in the Appendix). In turn, the timber sector reached a high VA peak in 1991, but has basically been decreasing since then, confirming that this fluctuation was a local phenomenon. Other evidence also supports this observation: For example, the average profitability of the wood business has been decreasing since 1992 (Figure 3) and at least 9 out of 148 wood-processing facilities have closed down between 1995 and 1997 (own data). At the same time, stumpage fees (a common expenditure for acquiring logging rights in Paragominas) have been increasing rapidly. Changes in the sectoral production structure have also been dramatic in Paragominas. 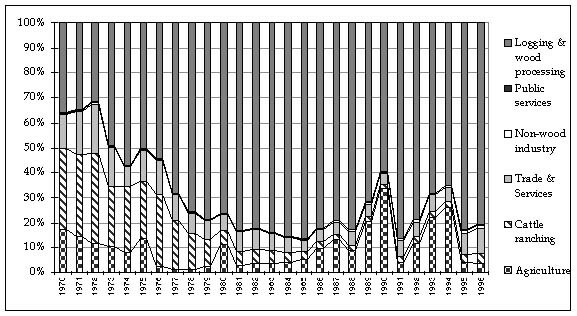 While in the early 1970s the wood sector represented around 40 percent of GDP in Paragominas, the relative contribution of this sector increased to more than 80 percent, on average, in the 1980s and 1990s (Figure 4 and table A-1). Two main features can be observed from the sectoral structure of Paragominas’ GDP: the consolidation of resource dependency and the significant income-generating capacity of the timber sector. Although cattle ranching has had its historic and cultural importance in Paragominas, its economic contribution has been modest. A single sawmill operating in the year of 1970 generated more VA than the whole cattle sector alone (own data). Longer distances to extraction areas and higher stumpage fees are tendencies that can already be observed in Paragominas (Stone 1998), both due to the local phenomenon of timber scarcity. Being typically resource-dependent, Paragominas’ economy has risen and fallen with the fate of the wood sector. It responded to resource abundance in the 1970s and 1980s by attaching little value to pristine forests and adopting careless timber extraction techniques. Easy profit making attracted investment capital that resulted in a considerable increase in the wood-processing capacity. In the early 1990s, when Brazil’s economy was being heated up by hyperinflation, profits were even more generous, but resources became scarce and more dearly valued in Paragominas. By the middle to late 1990s, a period of severe scarcity and decline in the wood industry, probably also aggravated by the general economic recession, was beginning to be felt. where:X = value added or true (sustainable) incomeR = total periodical receipts, net of extraction costsr = the discount raten = the number of periods of exploitation until exhaustionX/R = the ratio of real value added to total receipts1 - (X/R) = the user cost. Due to the rapid pace of depletion of timber resources in Paragominas, far exceeding forest regeneration, logging can be treated as a resource mining activity, i.e. the resource base will eventually tend to converge on zero. Hence, El Serafy’s method can be used, although forest resources are obviously renewable and the method was originally devised to examine the exploitation of exhaustible natural resources. One of the advantages of using El Serafy’s method is that the user cost (1-(X/R)) can be approximated by a formula involving the discount rate and the ratio of annual production to total resource stock (1 / (1 + r)n +1). Inputs are few, avoiding complex valuation issues. The data needed are nothing more than the total revenue of the activity in question net of extraction costs and estimates of number of years until resource exhaustion. A clear disadvantage, however, is that the uncertainty of the estimate, in addition to the choice of discount rate, influences the solidity of the results. Therefore, a display of various scenarios is a preferable option (see Table A-2 in Appendix). In our case study a combination of optimistic and pessimistic deforestation estimates with low and high discount rates produced user-cost results ranging from 7 percent to 47 percent of GDP in 1996 (Figure 5; see also Table A-2 in the Appendix for details). These costs showed to be rapidly increasing throughout the series, especially for the low discount rate scenario. Also common for both the pessimistic and optimistic scenarios is the rapid pace of depletion. User-cost calculations nevertheless fluctuate dramatically with choice of discount rate, indicating that the model is over-sensitive to the choice of this variable. In this respect, the difference between the optimistic and pessimistic estimates of remaining timber resources plays a secondary role. If a low discount rate is applied, which is consistent with the evaluation of activities involving environmental resources, user costs are considerably higher, achieving 39 percent to 47 percent of GDP in 1996 for the pessimistic and optimistic approaches respectively. With such figures it is clear that resource depletion will soon jeopardise production. In other words, the current generation in Paragominas is passing on a resource and environmental debt to future generations amounting to almost half of today’s gross income. Only the other half can be considered true or sustainable consumption allowance. Although with a degree of uncertainty, the user-cost method functions as an early warning system of an unsustainable development path. However, the method per se does not give any indication of when the alarm clock should ring. Also, when economic actors tend to favour current consumption in detriment of future, a high discount rate is applied. In the case of Paragominas, user-cost results dropped to 7–11 percent of GPD at a 15 percent discount rate, figures that do not necessarily call for a policy change. This may well be the case in Paragominas. Field interviews indicated that local entrepreneurs are perfectly aware of the level of degradation that their activities impinge on the environment. However, they envisaged Paragominas after the year 2000 with much less forest, more recuperated pasture and large areas of intensive soybean plantation for export. In a subsequent development phase, soybean production could eventually link up with a growing local agro-industry. Although our data clearly point to the decline of the wood sector, the timely realisation of such a vision, with the maintenance of welfare levels, would mean a successful transition to a less resource dependent economy. Should such transition take place in the near future in Paragominas, user costs would be gradually diminishing. As Paragominas’ economy is fuelled by the timber sector to a large extent, decreasing production will eventually lead to decline with all its implications, namely recession, unemployment, and decapitalisation. Perspectives are therefore not very promising, confirming the impression of the fragility of resource dependent economies. This process can only be avoided if the entire economy switches to a different development strategy based on less resource dependent activities. While the user-cost method has been shown to work well as an early warning system regarding how overall patterns of capital substitution are reflected in income, it is less successful in demonstrating which strategy can maximise resource allocation over time. For this, cost-benefit analysis may be more suitable. Two studies from Paragominas are aimed at comparing land uses from economic and ecological sustainability points of view by using cost-benefit analysis. They have been carried out by Almeida and Uhl (1995) and Barreto et al. (1998). Both studies are analyses of NPV per hectare of extensive versus intensive land-use practices for agriculture, cattle ranching, and logging. They conclude that by intensifying these land uses (management-based strategies), not only would economic returns be higher, but also land stewardship would become more ecologically sustainable. Among the management studies, we have chosen the one by Barreto et al., as it focuses on the use of forest resources. Their study departs from the observation that unplanned timber extraction is the norm in Paragominas (ibid. p. 11). Two different timber extraction methods (planned and unplanned) were applied to plots not previously logged, and the results were compared. In the planned forestry case, the extraction area was demarcated, and a complete forest inventory was carried out. Increased labour was involved in the logging process, and less wood was wasted due to better felling and skidding techniques. Altogether, planned logging resulted in lower ecological impacts and more rapid forest regeneration. Common to the studies of Almeida and Uhl (1995) and Barreto et al. (1998) is that unless income is fixed and better management leads to less pressure on forest resources, higher profits in a management system will only increase land-users’ thirst for new land, thus adding to deforestation. To suppose that land-users will not strive to increase their income is a strong assumption present in both studies. Even though an improved management system can be unsustainable, land conversion continues. The optimal development strategy in cost-benefit analyses is defined as the most economical land-use option, but no discussion of intertemporal equity is put forward. Another cost- benefit study by Andersen (1997) proposes another approach, also leaning on data from Paragominas. She attempts to determine to what extent the current deforestation level in the entire Amazon deviates from the social optimum by using an approximation of shadow prices in cost-benefit analysis (ibid. p. 7). The benefits of clearing land are compared to a non-destructive use of forest resources. The author distinguishes between three different decision makers: the farmer, the federal government, and the global social planner. The farmer opts for the slash-and-burn option, generally preceded by logging. The federal government would tend to favour a more intensive agricultural land use. The global planner will at some future stage see the benefits of protected forests exceeding the benefits derived from agricultural use. Andersen’s study confirms that the currently prevailing economic dynamics of Amazonia are feasible: The benefits of deforestation exceed those of conservation. In reaching this conclusion, however, the study suffers from one major deficiency, namely that of extrapolating data from a restricted area to the whole of Amazonia without an adequate degree of precaution. For this, data from the Paragominas management studies concerning economic activities on cleared land are used. Data on non-destructive uses, such as the extraction of non-timber products, biodiversity, and recreational value, are calculated from various sources and do not contain an equivalent degree of richness and credibility. This indicates that estimates of non-use benefits of forest resources are difficult to derive in practice. Andersen, like Almeida and Uhl and Barreto et al., embraces the sustainability debate from an efficiency viewpoint. The optimal development strategy is defined as the most economical land-use option. However, the question of intertemporal efficiency is not addressed. In the case of Andersen, intertemporal equity, not to mention ecological sustainability, is less of a problem today, due to the vastness of undisturbed forest in Legal Amazonia (covering 87 percent of the original forest area as of January 1998 according to INPE). Does this indicate that user-cost calculation is the right approach for ascertaining sustainability? Not completely, but the comparative advantage of cost-benefit analyses is obvious. First, the calculation of user costs is not contingent on adherence to the principle of weak sustainability. User-cost methods simply confer an ex post assessment of actual economic activities (in this case, exploitation of a natural resource). Only when comparison with total investment (or savings) is deemed relevant does the user-cost interpretation fall within a weak sustainability framework. On these grounds, Vincent and Rozali (1997, pp. 44-5) acquit the Malaysian government of the charges by environmentalists and Western governments of implementing policies leading to over-exploitation of the country’s forest resources. Due to massive investment in reproducible capital, the country did better than Hartwick’s Rule. In this sense, the natural capital of a region or a country can be depleted totally, and even so it could be claimed that the development model is sustainable. The policy implication is that the user-cost method can be used as an early warning method against unsustainability, but there is no guarantee that the development model will be sustainable, if this requires preservation of the stock of all capital forms. In cases of low pressure on addressing the issue of restriction of resource use, in the absence of political commitment and pressure from the outside world, the natural capital stock might dissolve. The few attempts to suggest indicators of strong sustainability, insisting on the conservation of the stock, hardly seem convincing (see, for example, Pearce, Hamilton and Atkinson 1996). Secondly, since the user-cost method only deals with the use of one resource at a time, the constraints of underpricing and ignorance of changes in relative prices – problems encountered in cost-benefit analysis – can be largely disregarded. The objective in the application of user costs is not to choose the most viable project or strategy but to show the macro-economic significance of the depletion of an essential resource for a country, region, or in our case study, a municipality. After 26 years of intensive resource use, the wood industry, currently responsible for over 80 percent of the total income generated in the economic territory of Paragominas, is now experiencing the first signs of decline. Deforestation is reaching critical levels locally, and timber scarcity is definitely the major cause of Paragominas’ current crisis. Mills are shutting down, others are moving closer to extraction areas, and the per capita income has been falling since 1992 (Figure 6). Both from an economic and an environmental perspective, the path pursued by Paragominas is clearly unsustainable. Forest resources in Paragominas will only last for another fifteen to nineteen years. The only other option left is to substitute the forestry economy with a cattle-based economy, and there are signs that this is taking place. Our attempt to compare our application of the user-cost method with cost-benefit analyses in a specific case study (Paragominas) demonstrates that a better management system is not necessarily equal to moving towards sustainability. In cases when uncertainty prevails, cost-benefit analyses will not be sufficient to detect unsustainability; they can only detect inefficiency. As an early warning system, the user-cost method has proven to be applicable with success, even in situations of uncertainty. Regarding future perspectives, it is probable that Paragominas will intensify its land uses to some extent in the coming years. But the demand for efficiency will probably weigh more heavily in decision making than environmental concerns. Therefore, intercropping will not necessarily be the choice, with perennials and long-cycle forest management in native forests, as Almeida and Uhl desire. But soybean monoculture and plantations of fast growing timber species for veneer production may become more common in Paragominas in the next five or ten years. By then, the remaining area of native forest may be reduced to a few scattered patches in the landscape. Paragominas may also eventually become a prosperous agro-industrial centre, say in fifteen to twenty years time. Certain municipalities in the state of Paraná in southern Brazil (e.g. Pinheiros and Assis Brasil) also had an economy based on the exploitation and processing of timber resources in the 1960s. The elements were basically the same as those encountered in Paragominas: intense resource use, exhaustion and decline. But the competition for agricultural land has prevailed, and their current economies are now based on the mechanised planting of grain crops with links to the local industrial sector. Today, these municipalities are prosperous agro-industrial districts with fairly high income and welfare levels. A brief analysis of their development path shows that Pinheiros and Assis Brasil have apparently managed to break the resource dependency cycle and generate welfare. A similar path for Paragominas is not unthinkable. It is worth noting that a development trajectory similar to that of Pinheiros and Assis Brasil has no problem passing a weak sustainability test. The patterns of capital substitution seem to have benefited the local economy in the long run. But the example also indicates the importance of acknowledging a time-span limit to weak sustainability analyses. How long should an analysis of the trade-offs of capital substitution stretch itself – over thirty, fifty or a hundred years? Bearing global resource dependency in mind leaves us with no choice but to condemn indiscriminate capital substitution. Also along these lines, what is most crucial for ecologically rich environments such as the Amazon is to perceive the uniqueness of the environment and its global significance, which suggests a precautionary approach. If a considerable portion of the Amazon is going to pursue a path similar to that of Paragominas, then there are enough reasons for concern. Our analysis, covering 26 years of the Paragominas economic history, has shown that the prevailing conditions of resource use leave the economy extremely vulnerable, and that future generations will have considerably fewer opportunities than current ones. ALMEIDA, Oriana Trindade de and Uhl, C, 1995. Developing a quantitative framework for sustainable resource-use planning in the Brazilian Amazon. World Development, 23 (10): 1745-1764. ANDERSEN, Lykke E, 1997. A cost-benefit analysis of deforestation in the Brazilian Amazon. IPEA [Instituto de Pesquisa Econômica Aplicada], Texto para Discussão, No. 455. Rio de Janeiro. BARBIER, Edward; Markandya, Anil and Pearce, David, 1990. Environmental sustainability and cost-benefit analysis. Environment and Planning, 22: 1259-1266. BINSWANGER, H, 1989. Brazilian policies that encourage deforestation of the Amazon. Working paper 16, Environment Department, World Bank. Washington, D.C.
BROWDER, J. O, 1988. The social cost of rain forest destruction: A critique of the "Hamburger Debate". Interciencia, 13 (3): 115-120. COMMON, M. and Perrings, C, 1992. Towards an ecological economics of sustainability. Ecological Economics, 6: 7-34. COMMON, M., 1997. Beckerman and his critics on strong and weak sustainability: Confusing concepts and conditions. Environmental Values, 5: 83-88. DASGUPTA, P. AND Mäler, K.-G., 1994. The environment and emerging environmental issues. In: Richard Layard and Stephan Glaiter 1994. Cost-benefit analysis, Cambridge University Press, Cambridge. EL SERAFY, Salah, 1989. The proper calculation of income from depletable natural resources. In: Ahmad, Y.; El Serafy, S. and Lutz, E. (eds. ), 1989. Environmental Accounting for Sustainable Development. UNEP [United Nations Environmental Programme], World Bank. Washington, D.C.
EL SERAFY, Salah, 1997. Green accounting and economic policy. Ecological Economics, 21: 217-229. HAMILTON, Kirk, 1994. Green adjustments to GDP. Resource Policy, 20 (3): 155-168. HARTWICK, John and Hageman, Anja, 1993. Economic depreciation of mineral stocks and the contribution of El Serafy. In: Lutz, Ernst (ed. ), 1993. Towards improved accounting for the environment. World Bank, Washington, D.C.
HECHT, Susanna B.; Norgaard, Richard; Possio, Giorgio, 1988. The economics of cattle ranching in eastern Amazonia. Interciencia, 13 (5): 233-240. IBGE, 1970, 1975, 1980, 1985. Censo agro-pecuário do Brasil: Censo econômicos, estado do Pará. IBGE [Instituto Brasileiro de Geografia e Estatística]. Rio de Janeiro. IBGE, 1970, 1975, 1980, 1985. Censo comercial do Brasil: Censos econômicos, estado do Pará. IBGE. Rio de Janeiro. IBGE, 1970, 1975, 1980, 1985. Censo de serviços do Brasil: Censos econômicos, estado do Pará. IBGE. Rio de Janeiro. IBGE, 1970, 1975, 1980, 1985. Censo Industrial do Brasil: Censos econômicos, estado do Pará. IBGE. Rio de Janeiro. IBGE, 1970, 1980, 1991. Censo demográfico do Brasil: Estado do Pará. IBGE. Rio de Janeiro. IBGE, 1996. Contagem da População: CD-ROM. IBGE. Rio de Janeiro. IBGE, All years from 1973 to 1996. Pesquisa agro-pecuária anual: Estado do Pará. IBGE. Rio de Janeiro. IDESP, 1995. Sumário estatístico do município de Paragominas. IDESP [Instituto de Desenvolvimento Econômico e Social do Pará], mimeo. Belém. KELLENBERG, John, 1996. Accounting for natural resources in Ecuador: Contrasting methodologies, contrasting results. ESD [Environmentally Sustainable Development], World Bank, Washington D.C.
LITTLE, I. M. D. and Mirrlees, J.A., 1994. In: Richard Layard and Stephen Glaister, 1994. Cost-benefit analysis. Cambridge University Press, Cambridge. MATTOS, Marli and Uhl, Christopher, 1994. Economic and ecological perspectives of cattle ranching in eastern Amazonia. World Development, 22 (2): 154-158. MUNASINGHE, Mohan and Lutz, Ernst, 1993. Environmental economics and valuation in development decisionmaking. In: Munasinghe, M. (ed. ), 1993. Environmental economics and natural resource management in developing countries. Washington, D.C. MUNDA, Giuseppe, 1996. Cost-benefit analysis in integrated environmental assessment: some methodological issues. Environmental Economics, 19: 157-168. PEARCE, David and Atkinson, Giles, 1992. Are national economies sustainable? : Measuring sustainable development. CSERGE [Centre for Social and Economic Research on the Global Environment], Working Paper GEC 92-11. London. PEARCE, David and Atkinson, Giles, 1993. Capital theory and the measurement of sustainable development: An indicator of weak sustainablity. Ecological Economics, 8: 103-108. PEARCE, David and Turner, R. Kerry, 1990. Economics of natural resources and the environment. Harvester Wheatsheaf, New York, London, Toronto, Sydney; Tokyo, Singapore. PEARCE, David, 1988. Economics, equity and sustainable development. Journal of Forecasting and Planning, 20/6. PEARCE, David; Barbier, Edward and Markandya, Anil, 1990. Sustainable development: Economics and environment in the third world. Edgard Elgar Publishing Limited. Aldershot, UK and Brooksfield, USA. PEARCE, David; Hamilton, Kirk and Atkinson, Giles, 1996. Measuring sustainable development: Progress on indicators. Environment and Development Economics, 1: 85-101. PERRINGS, C.; Mäler, K.-G.; Folke, C.; Holling, C. S. and Jansson, B. O., 1995, Unanswered questions. In: Perrings et al., 1995. Biodiversity loss - Economic and ecological issues. Cambridge University Press, Cambridge. REPETTO, R.; Cruz, W.; Solórzano, R.; Camino, R. de; Woodward, R.; Tosi, J.; Vásquez, V.; Villalobos, C.; Jiménez, J, 1991. Accounts overdue: Natural resource depreciation in Costa Rica. WRI [World Resource Institute] and TSC [Tropical Science Center]. Washington D. C. and San José. SADOFF, Claudia W, 1995. Natural resource accounting: A comparison of methodologies and application to Thailand's logging ban. In: Shen, S. and Contreras-Hermosilla, A, (eds. ), 1995. Environmental and economic issues in forestry: Selected case studies in Asia. World Bank Technical Paper No. 281, Asia Technical Department Series. Washington, D.C.
SCHNEIDER, Robert R, 1995. Government and the economy on the Amazon frontier. World Bank Environment Paper No. 11. Washington D.C.
STONE, Steve, 1998. Evolution of the Timber Industry Along an Aging Frontier: The Case of Paragominas (1990-95). World Development, 26 (3): 433-448. TONIOLO, Angélica and Uhl, Christopher, 1995. Economic and ecological perspective on agriculture in eastern Amazonia. World Development, 23 (6): 959-973. UHL, Christopher and Buschbacher 1985. A disturbing synergism between cattle ranching burning practices and selective tree harvest in eastern Amazonia. Biotropica, 17: 265-268. VERÍSSIMO, A.; Barreto, P.; Mattos, M.; Tarifa, R. and Uhl, C, 1992. Logging impacts and prospects for sustainable forest management in an old Amazonian frontier: The case of Paragominas. Forest Ecology and Management, 55: 169-199. VINCENT, Jeffrey and Rozali, Mohamed Ali, 1997. Environment and development in a resource-rich economy: Malaysia under the new economic policy. Harvard University Press, Harvard. WATRIN, O. dos Santos and Rocha, A. M. A. da, 1991. Lavantamento do uso da terra no município de Paragominas (PA) utilizando imagens TM/LANDSAT. EMBRAPA-CPATU. Boletim da Pesquisa, No. 142. Belém. (a)	To eliminate the effects of inflation and numerous currency changes, all values in Brazilian current prices that were inputs in time series have been converted to Cruzeiros (Cr$) of 1980 and deflated by the national consumer price index. Final results were converted to 1980 US$ using the official rate of exchange. (b)	Production value of the agricultural sector was based on figures published in IBGE's census complemented by annual surveys. For years where data was unavailable extrapolations were used. Toniolo and Uhl (1994) provided details on the cost structure of the agricultural sector of Paragominas based on field surveys conducted in 1992, producing Value Added/Production Value (VA/PV) ratios that were calculated for perennial and annual crops respectively and extrapolated for the entire period. (c)	While the total number of head of cattle are published every year by IBGE, it is only possible to calculate the exact production of live animals for the census years. Extrapolations were made for the remaining years. Mattos and Uhl (1994) provided the cost structure of Paragominas' cattle sector. VA/PV ratios were assumed constant over the entire period. (d)	The urban sectors include trade, marketable services, non-wood industry and the public sector. Value-added estimates for trade, services and non-wood industry were calculated using data from IBGE's economic census of 1980 as a baseline year. Salaries are the main VA component of the public sector. These were estimated for 1980 on the basis of Almeida and Pedrosa’s unpublished data (1996). The relative consumption of electricity of each urban sub-sector was informed by IDESP, while the total consumption for the whole time series was provided by CELPA (Electricity Company of Pará). The indexed electricity consumption for each urban sub-sector respectively was entered as a growth quantum and was used to arrive at the time series VA estimates for each of them in constant prices. (e)	For the logging and wood-processing sector IBGE’s data were used to estimate the relative changes in real unit prices of roundwood and the changes in the real prices of different production inputs throughout the series. Being more reliable and precise, IMAZON’s data complemented by our own field surveys, were adopted for estimates of the physical production, stumpage fee in time series and the cost structure of logging operations, sawmills and veneer/plywood industries (1990 was the baseline year). Results for this sector in Cr$ of 1990 were finally converted to Cr$ of 1980 to be added to the remaining sector. (a)	Deforestation estimates were based on a combination of satellite readings taken in 1988 by Watrin and Rocha (1991) and physical production figures for logging, agriculture and cattle ranching respectively (such activities known to cause deforestation). An initial deforestation ratio of 2% of total forest surface was assumed for 1965, and adjustments were made to avoid overlapping of areas initially logged and later totally cleared for ranching or agriculture. In this scenario, 63% of Paragominas’ forest had been deforested by 1996. (b)	Due to the uncertainty in deforestation estimates and the probable exaggeration of figures for land in fallow and degraded pasture, more optimistic estimates were made, assuming the total area deforested after 1988 to have been smaller than the one assumed for the pessimistic estimate, but still maintaining the area deforested in 1965 at 2% and 34% in 1988. Estimates of deforested area for the years after 1988 in the optimistic scenario were based on linear regression (as in Watrin and Rocha (1991)), assuming a continuity in the deforestation pace observed in the evolution of total deforested area between 1980 and 1988 (R2=0.995). Total area deforested in 1996 was 15% smaller in this scenario than in the pessimistic one. (c)	Estimates of timber reserves were based on reserve-to-production ratios, where mature forests in Paragominas were assumed to contain 38 m3 of commercial wood per hectare, as informed by Veríssimo et al. (1992). This variable entered the calculation as n, or the number of periods to resource exhaustion. (d)	Actual user-cost calculations were based on the formula in Equation (1) in the text. The user cost of logging and wood-processing was initially calculated as a percentage of the sector’s revenue by applying the other side of the equation correspondeing to user-cost (i.e. : 1 / (1 + r)n+1 , where r is the discount rate and n the estimates of remaining timber in years). The same data used for the VA calculation of the logging and wood-processing sector was used here (see footnote e in Table A-1 for details). The VA of verticalized logging and wood-processing was calculated per cubic meter of extracted timber, producing the user cost per cubic meter of timber. These results were then multiplied by the annual production of roundwood and compared to Paragominas’ total GDP, producing final results in the above table. All prices applied were constant and in the same currency, using the deflation method described in footnote (a) of Table A-1.